I've clearly been dismal at posting to my blog for several months now, but I hope to entice you all back into the readers' fold with posting a little more often...there is so much going on at the homestead lately. Aside from Drew breaking his collarbone two weeks ago, putting him out of work for a minimum of 8 weeks, we've been back to working on the house more intensively. We are nearly finished with our bedroom walls, and we poured our garage slab last week. Karl is back on the job for two months, and we're trying to push to get into our kitchen. Amid doing the basic homestead chores for two people and working full-time on the house, I'm still nurturing our garden along. After a looooooong wait for many of our warm-weather, summer crops, they are at last filling out, plumping up, and reaching harvestable size. All except the tomatoes. Tomatoes are the garden crop that keeps me going, that motivates me in the winter when I start seeds. So it's been a little disappointing that they are just now coming barely, and slowly ripe. We have been eating a lot of sweet corn, zuchinni, green beans, cucumbers, and a few cherry tomatoes, a little basil, and so on. The winter squash harvest looks to be a bumper, and today, I prepared beds for all our winter crops: broccoli, brussels sprouts, cabbage, and kale. The carrots and beets are already almost ready. I'm hoping we won't miss the window this year due to gophers or bad weather. 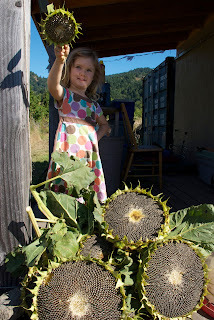 Today, I harvested our beautiful sunflower heads, which were drooping and heavy with the weight of seeds. 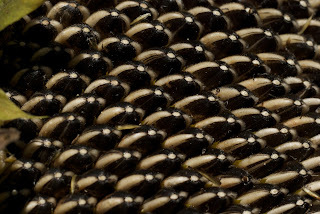 Once I looked closely, I understood why, as each ten-inch disk was packed with black and white seeds swirling into the center of a fibonacci spiral. 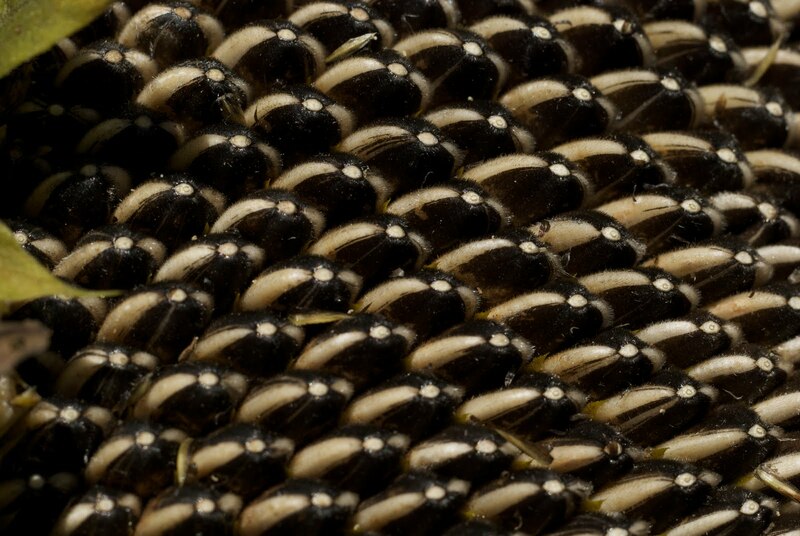 I clipped each head below some leaf branches, and wiped off the remaining flower tops to reveal the seeds underneath. Ella helped me carry them to the shed porch, where I hung them up to dry with some twine indoors, to protect them from birds and mice. But not before I sampled some raw, fresh seeds, which before they acquire the gray color you see in the store-bought variety, are pure white and very flavorful. What a rich food we can grow so easily. 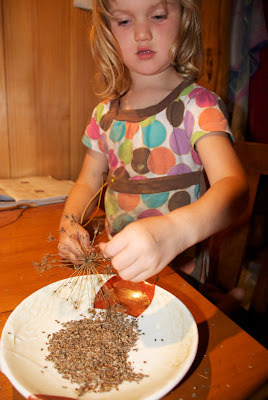 Tonight after dinner, Ella and I carefully removed all the dried seeds from the heads, to save for gifts, for making sauerkraut, flavoring pickles, and to plant again next year. 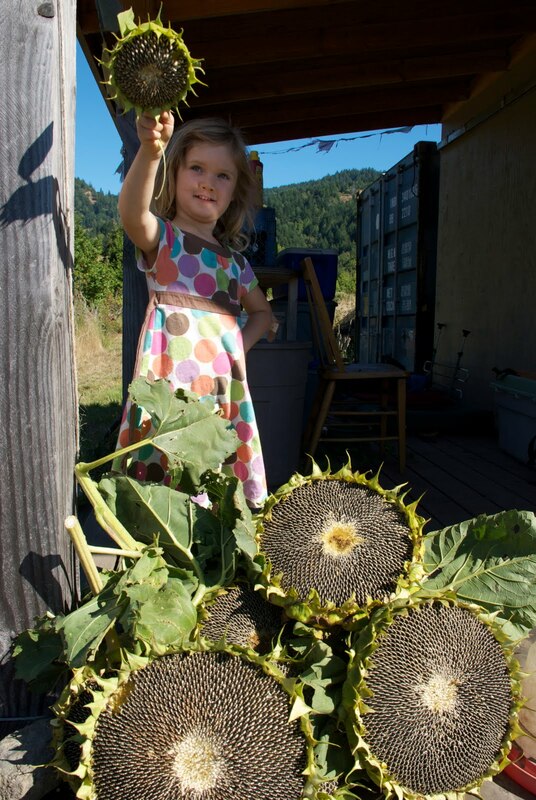 A full cycle of locally-grown seed is a good feeling indeed. Amazing Amanda. The contrast with our suburban existence is great. Hey Amanda- The place looks great! We want to do a similar wall finish with structolite. Do you mix anything with the structolite, or how did you finish them?